Groovy Cuphea that we grow as an annual. In mild winters and with good drainage this rainbow of a plant may over winter. Either way its a long, long blooming plant from June to frost. 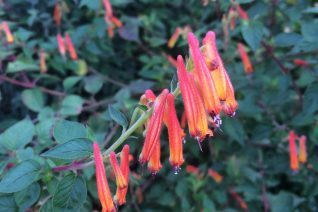 Spikes appear continuously holding tubular shaped flowers- they begin yellow and age to orange for a multicolor effect that yields a dramatic show. To 10″ x 1′ forming an expanding clump. Full sun and rich well drained soil with regular summer irrigation. Best on the edge of a container where the spikes which protrude nearly horizontally will showcase the flowers. 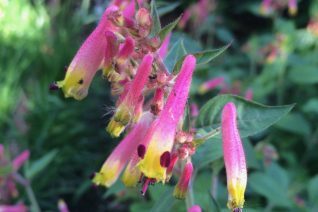 Loved by hummingbirds, bumble bees and just about any pollinator. Remove spent flower spikes to encourage more. Very easy to grow. Mexico. This plant has been a real surprise. Most Cupheas are decidedly tender to cold in our climate, however, this variety soars above the rest. Its been a long term reliable perennial for us. Perhaps just a smidge hardier than the species. This charming little bat flower delights with multicolor flowers- tubular and shades of pink and yellow. The petals that serve as the bats ears are maroon. Wonderful long blooming plant- flowers continuously all summer to autumn. To 1′ tall and as wide. As a perennial it excels in rich, well drained soil with regular summer water in full sun. Just when you think it won’t return in spring it quickly arrives with warm weather and commences blooming almost straight away. Loved by hummingbirds, butterflies and pollinators in general. Treat it well – water and establish and mulch for the first winter. As an annual it is wonderful as a continuous flowering container subject. Native to Mexico. We originally grew this wonderful vivid free blooming bat flower as an annual. But after years of growing it in the ground we’ve found that its remarkably root hardy. To 20″ tall forming a semi-woody shrublet it produces sprays of small but vivid flowers from May to frost. Full sun and rich, WELL DRAINED soil in the ground and patience- it takes a while to come back in spring- usually not until truly hot days appear in May. Once up- with regular supplemental water it zooms and blooms and resumes its previous stature quickly. Good drainage in a hot position seems to be the key as a perennial. Mine has happily lived in the ground in my garden in North Portland for 7 years- returning from the coldest winters. It will freeze to the ground below about 28ºF- but it always returns. 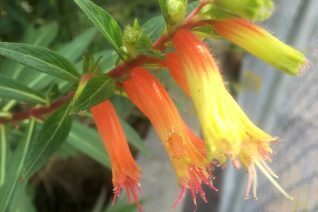 Great seasonal plant in containers and it will draw hummingbirds from 5 counties around. Nice plant. Blooms continuously without intervention. My kind of plant.